The new high-power crusher includes a constant feed opening, steep cavity and a wide range of effective strokes. 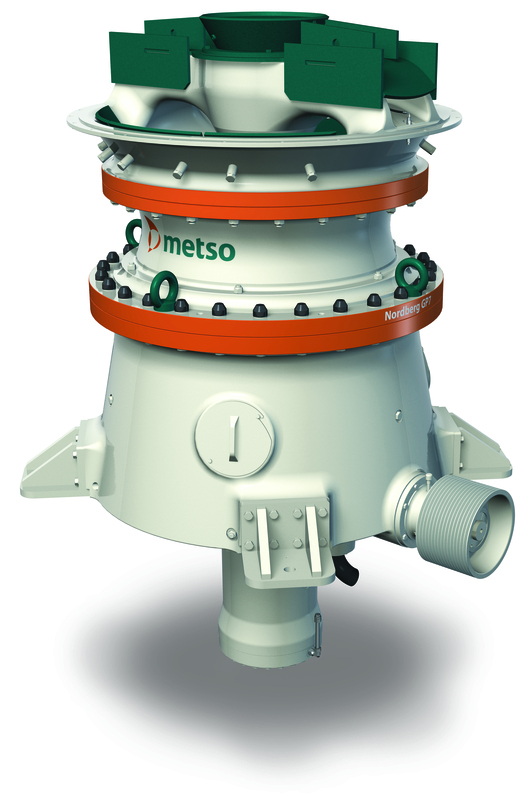 Metso continues to expand its range of high capacity crushers by launching Nordberg GP7 (in the picture), its largest Nordberg GP secondary gyratory crusher to date. The new 58-ton (128 000 lbs) crusher features the most ideal combination of feed opening, cavity design and capacity available on the market. This ensures high crushing performance with even the hardest feed and helps maintain operational costs low. In addition, the crusher is safe to operate and maintain. Nordberg GP7 is well suited for both mining and aggregates applications. It can be fed with a large primary crusher such as the Nordberg C200 jaw crusher or Nordberg SUPERIOR primary gyratory crusher, and followed by a Nordberg HP6 cone crusher for tertiary crushing. The Nordberg GP7 secondary gyratory crusher features a large feed opening of 450 mm (18"), which remains constant throughout the lifetime of the liners. This is one of the most significant benefits of the new crusher. The constant feed opening ensures steady performance and stable end-product quality, which translate into predictable revenue and excellent process throughput. Nordberg GP7 has seven strokes available as standard. The possibility to select a suitable combination from the strokes (25 - 50 mm, 1 - 2") ensures perfect adaptability for any application. The steep cavity and easily changeable stroke ensures high performance when using a power rating as high as 550 kW. In fact, Nordberg GP7 has the highest power rating in its size class. And thanks to the robust design specific to Nordberg GP, the GP7 adapts for varying feed conditions. The limited number of service points can be accessed safely and easily. As with all Nordberg GP crushers, Nordberg GP7 is delivered with all tools required for safe maintenance work. 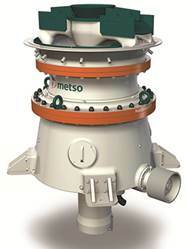 Process control is based on an advanced Metso IC automation that provides easy, safe, and trouble-free operation. The Nordberg GP7 secondary gyratory crusher has exactly the same footprint as the Symons 7' and similar crushers which makes replacement of an old crusher very easy.